I was raised to believe that all goats were good for was hopping through pastures and eating grass. It wasn’t until I began working closely with Happy Days Dairies that I fully began to appreciate just how awesome goats really are. Turns out these friendly little creatures create milk with quite an awesome nutrient profile. The way I see it, goat milk is comprised of 4 pillars of awesome. Otherwise known as macronutrients (protein, fat, carbohydrate) and micronutrients (in this case we’re talking about minerals). Protein. Our bodies are made up of protein. We rely heavily on both animal and plant sources to supply an adequate amount of amino acids; the building blocks of protein, which help us to create the enzymes necessary to function on a day-to-day basis. Goat milk is a good source of low-cost, high quality protein, delivering 8 grams in every 250mL. The amino acid most prevalent in goat’s milk is tryptophan, best known for its sleep-inducing affects after a large turkey meal. But that’s not all it’s good for! Tryptophan helps to stimulate our growth hormones which are necessary for normal growth development in children, regulate sleep patterns, appetite, and assist those that struggle with headaches and migraines. Healthy fats. The fat in goat milk is made up of 30-35% medium-chain fatty acids (MCTs). Studies have shown that MCTs can help you burn more calories, promote fat oxidation (the shrinking your fat cells) and reduced food intake. In addition, these MCTs have a 5% higher absorption rate when delivered in the form of goat milk. Carbohydrates. Ah, the C word! Don’t be scared. You’ve heard of lactose, right? Well, lactose, otherwise known as milk sugar, is a form of carbohydrate. In the case of goat’s milk, it has about 1% less lactose than conventional milk meaning that goat’s milk is easier to digest for individuals with intolerance to this milk sugar. Not only that, but goat’s milk is also considered hypoallergenic due to its low amount of casein (the same protein that’s in human milk) making it a strong candidate for children who have otherwise been diagnosed with a sensitivity or allergy to dairy. Minerals. Brace yourselves! Goat milk is packed with calcium, phosphorus, magnesium and copper. Contrary to popular belief, these minerals are necessary to aid in the absorption and assimilation of calcium. Calcium is stored in our blood at all times to be used for blood clotting, nerve conduction, muscle contraction, regulation of enzyme activity, cell membrane function and blood pressure regulation. When dietary intake of calcium is too low to maintain adequate blood levels of calcium, calcium stores are drawn out of the bones to maintain normal blood concentrations. Counterintuitive, no? That’s why it’s so important that we have enough calcium in our diet that our body doesn’t have to leach it out of our bones to maintain a healthy blood calcium level. Weight loss, bone formation, healthy development for your children, safe for those with dairy allergies, high absorption, management of headaches… that’s one powerful pasture-loving, field hopping animal! Let’s cook with it, shall we? This recipe was developed for Happy Days Dairies. 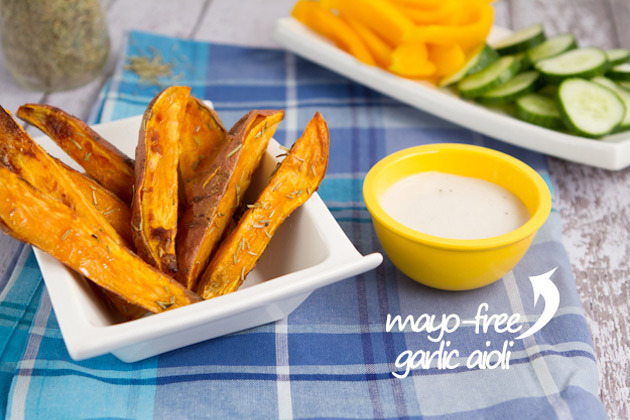 To print, email or text a dairy-free version of this recipe, click here. 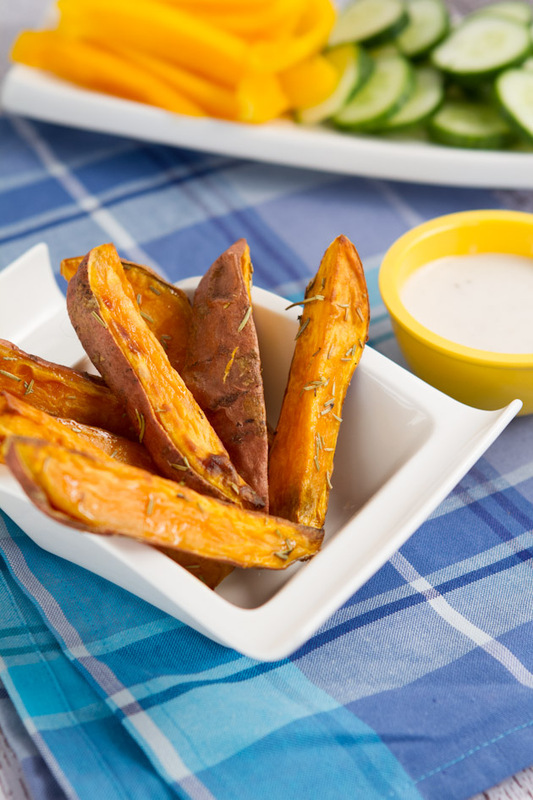 Crisp rosemary baked sweet potato wedges served with a low-fat garlic aioli made with plain goat yogurt. Preheat oven to 400F and set aside a small baking sheet. Thoroughly wash and scrub the sweet potato. Remove the tips from either end. Slice horizontally into thirds, then cut each section into thirds again. You should be left with a total of 9 wedges. Place wedges on the baking sheet and coat with oil, rosemary and salt. Place in the oven for a total of 25-30 minutes, filliping halfway through. Meanwhile, place all aioli ingredients in the bowl of your mini food processor or blender and blend until smooth. When wedges are done, place on a cooling rack for a couple of minutes to avoid from getting soggy on the pan or plate. Serve with aioli and a place of fresh veggies. Feel free to double up on this recipe to serve more people. Kevin hates everything about sweet potatoes so I made this a snack for one. I know… who doesn’t like sweet potatoes? Then cut each section in thirds again. Cover with oil, rosemary and salt and throw them in the oven. Meanwhile, get your aioli ingredients prepped and ready to blend. Garlic and goat dairy have to be my favorite combo. I’ve combined these two ingredients a bunch of different ways and love it more with each new recipe. When the wedges come out of the oven, place them on a cooling rack for a couple of minutes to avoid them from getting soggy. 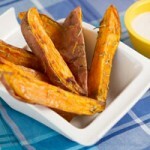 For a bit of extra protein you could try sprinkling the wedges with hemp seeds after they come out of the oven. For more of my goat dairy recipes, check this out. 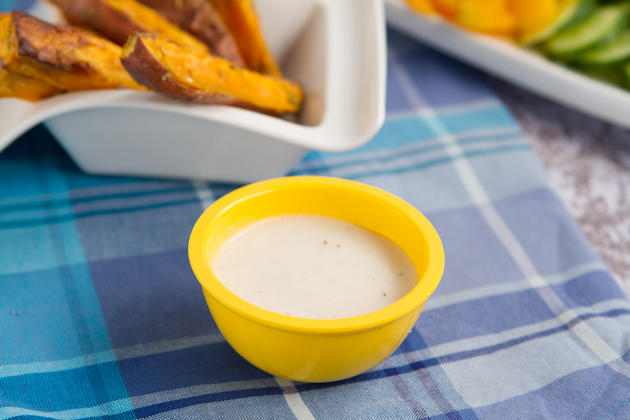 Do you enjoy dips for your fries or are you a straight-up salt-it-only kinda gal?